Snow and a large ski club conference are being credited for an 18 percent bus ridership increase on the Mountain Rides Transportation Authority system last month, compared to the previous year. “February 2014 was a great month considering the meager snowpack,” Mountain Rides Operations Manager Jim Finch said at a Wednesday meeting of the organization’s board of directors. “Ridership jumped significantly later in the month with the arrival of snow, visitors and the National Brotherhood of Skiers conference. “It was one of our best winter months ever, and it was accident free,” Finch said. Data released by Mountain Rides at Wednesday’s meeting shows that there were 69,845 bus or van rides in February of this year compared to 58,921 in February 2013. 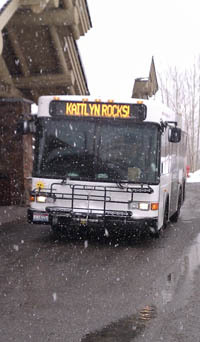 The organization’s free Blue Route, which serves the Ketchum-Sun Valley area, running between Elkhorn and Warm Springs, showed the largest system increase at 33 percent last month compared to the previous year. The Hailey Circulator Route, which provides free around-town bus service in Hailey, also showed a large increase, at 30 percent. The paid-fare Valley Route, which runs between the north and south valley areas, actually showed a 2 percent ridership decrease in February of this year compared to February 2013. Mountain Rides attributed the decrease to minor service reductions that were put in place in late 2013. The February ridership increase follows a modest 1.6 percent ridership increase in January of this year compared to January 2013. For the first two months of this year, Mountain Rides recorded a total of 136,117 rides, which computes to a 9.6 percent increase over the 124,162 rides tallied for the first two months of 2013. In other business, Mountain Rides Executive Director Jason Miller reported that progress continues on establishment of a south valley transit center at the intersection of Gannett Road and Clover Road in southern Bellevue. Miller told the board that Mountain Rides is currently pursuing preliminary design approval, federal environmental approval and a conditional use permit from the city of Bellevue. “I think we’re staying largely on track time wise,” Miller said. According to the project schedule, construction will begin in August or September and be finished by January of 2015. Just prior to adjournment of Wednesday’s Mountain Rides’ board meeting, board Chair Susan McBryant complimented the organization for posting messages about Blaine County 2014 Olympic medalists on the electronic destination signs on system buses. Finch explained that message recognized Sun Valley athlete Hilary Knight, who helped lead the women’s Team USA hockey team to a silver medal. “Did you think it was Hillary Clinton?” Finch said.